You might think that after reviewing a 15 CD box set of cello works that I might have had enough of the cello for a while, but not at all, especially when it is as good as this one, indeed this recording was the one I listened to as I finished the review of the cello concertos box. And I must say, this recording was better than any of those included in the set, which made it all the more pleasurable to listen to. The disc opens with a brilliant reading of the Shostakovich Cello Sonata, it was composed in 1934, and was given its première on Christmas Day of that year by the cellist Victor Kubatsky and with the composer at the piano. It was in 1936 whilst on tour with Kubatsky, which included performances of this Sonata, that Shostakovich first read of Stalin’s condemnation of his opera Lady Macbeth of Mitsensk. This is the finest recording of the work I have heard, and that includes Rostropovich (SU 41012), who is a little too muscular for my liking. Isserlis and Mustonen begin at a leisurely pace, with the first movement being a minute slower than the Rostropovich and although he is joined by the composer (so you would think tempos would be safe) the recording by Isserlis and Mustonen is a more detailed and emotional performance especially in the developmental section. This is followed by what is probably the best-known music of the whole Sonata, the short Allegro second movement, which Shostakovich once described as a minuet. It opens with the piano having the more interesting music played against the sawing of the cello, before the instruments swap and the cello gets the tune before going back to the piano. This is exhilarating music especially as played here, with Isserlis and Mustonen being even slightly quicker than Rostropovich and Shostakovich. This is in sharp contrast to the following bleak Largo, which although they are slightly quicker again than Rostropovich and Shostakovich, Isserlis and Mustonen maintain a darker and more desolate feel, with Mustonen shining here. The final movement is a rondo Allegro which, with its sinister main theme and frenzied episodic writing that gradually builds towards the abrupt conclusion, is a fitting end to the movement and the work as a whole. The next main work on this disc is the Ballade in C Op.15 by Prokofiev, a work composed when he was in his early twenties and which is supposedly based on a melody from his childhood. It begins in a melodic manner before moving into a more angular section, with piano writing that is more typical of the composer’s piano music of the period, before reverting to a more melodic writing for the cello over rippling effects in the piano. This is the fastest version of this piece that I know with Isserlis and Mustonen performing it with great style and panache. The Kabalevsky Sonata has always been a favourite of mine since I first heard it on an old IMP Masters CD with Tim Hugh and Kathron Sturrock (MCD 49). He was one of those composers who has suffered for toeing the line of ‘Soviet realism’ and for condemning the likes of Shostakovich and Prokofiev, indeed he had supported Stalin in his condemnation of Lady Macbeth of Mitsensk, as a result his music has often been described as being dull and uninteresting. However, as I have said, I always found the Sonata of interest and a favourite amongst the music of his that I have. Kabalevsky had seemingly had an affinity for the cello and had composed a number of works for the instrument beginning with his Two Pieces Op.2 of 1927. The Sonata was composed some thirty-five years later and premièred by its dedicatee Mstislav Rostropovich, who, with Lev Ginsburg, gave the first performance in February 1962. In the booklet note Steven Isserlis writes of his and Olli Mustonen’s liking of the work, and this can be heard in their performance, which is strong and detailed as well as committed. As good as Tim Hugh’s performance is, this new recording is better, it is taught, especially in the opening Andante first movement, and breathes new life into the Sonata and Kabalevsky’s music in general. Of the three shorter works, two I didn’t know; the Shostakovich Moderato which was only discovered in 1986, some fifty odd years after its composition, and Kabalevsky’s Rondo in memory of Prokofiev which, despite the enmity between the two men, is quite a heartfelt and tender memorial from one composer to the other. The other work is the well-known Adagio from Cinderella which Prokofiev himself arranged for cello and piano. These are no mere fillers, with the Kabalevsky nearly as long as Prokofiev’s Ballade and with all three pieces welcome additions to this recording. 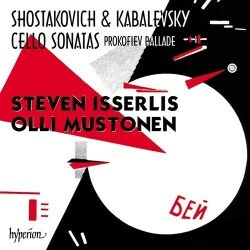 The collaboration between Steven Isserlis and Olli Mustonen produce performances of real integrity and understanding which comes from their regular partnership, indeed they have recorded the Prokofiev and Shostakovich before, so they have a history with these works and it is something that shows. This is an excellent performance, one which I will be enjoying regularly in the years to come. The recorded sound is also excellent as are the booklet notes by Steven Isserlis, who sets the scene well in his essay.